My final show at the Minnesota Fringe Festival was about to start in 10 minutes. I was sitting on the floor behind the curtain on stage at Bryant Lake Bowl & Theatre. I wanted to cancel this show badly. My tears were bordering right up to the brink of my eyelids. I knew they would storm out at any moment during the performance. I didn’t know if I could manage it well that night. That feeling of unpredictability had haunted me for quite some time since I started doing this solo performance in January. The element of unpredictability has become obvious for me these past few weeks, if not for months. There are performances where nothing happens, where I can deliver my script smoothly and no intense emotions arrive unannounced. Then there are performances where my tears start dropping with certain lines said and I am surprised by their arrival. It is usually not anger I am feeling. It is sorrow. Deep in my soul. The only difference now is that I have become more proficient at managing those tears. I can easily recover from the shock of their unannounced entry and move on to deliver my next lines. My last performance in Minneapolis was on Saturday, August 13th—the day after violence broke out amidst protests by White nationalists, White supremacists, and neo-Nazis in Charlottesville and Heather Heyer died and dozens were injured after a car plowed through the counter-protestors’ crowd.counter-protestors’ crowd. I had been reading articles and posts on Facebook about what transpired in this college town. By late afternoon that day, I was emotionally distraught and I cried off and on throughout the day. I was feeling mixed emotions, including anger, frustration, fear, and sorrow. I was debating if I should simply cancel the show. I feared the emotional upheaval that would arrive while being on stage. I wasn’t sure if I could manage it. But this time I knew exactly what would trigger me. The last segment of my solo show is my own past encounter with the Nazi salute. The incident took place in 1999 and I was with my ex-partner in Austin, Texas. While this salute occurred within the LBGTQ context, the story itself, one about intersectionality, took on layers of complexity because my ex-partner and I were both considered the “invading aliens” in this country—myself as an Asian student, her as a California-born Mexican American. I didn’t tell this story publicly for decades until the mass shooting at Pulse Nightclub in Orlando in 2016. It took that tragedy for me to tell it at a storytelling event in Chicago last year. At my last performance in Minneapolis, I had to muster all my strengths for my performance. The violence of that day consumed me. I was surprised that I could get through the show without breaking down. But then it hit me right after I delivered my last line. I was hoping to thank the fringe festival and the staff at the venue and had prepared a short speech for that. I couldn’t do it. I just broke down and started weeping. I managed to explain to the audience that it was a rough day, and they understood what I meant. It was a rough day for everyone, and we were all feeling raw in our own way. After the show, a couple of audience members hugged me to console me. I believe that you should refrain from sharing difficult and traumatic stories on stage until you, to a certain extent, process them first and give them some perspectives and meanings, both emotionally and intellectually. While I use the term “process,” I don’t intend it to mean overcoming, getting over, or completely distancing yourself emotionally from traumatic events, if that’s even possible. What I mean is that you maintain the ability to travel back and forth, mentally, intellectually, and emotionally, between being you and experiencing what happens to you at that moment and telling what happens to you while looking back at yourself and the event with a distance. You need emotions because they are what connect you to the audience, but you don’t want them to overwhelm you to the point of paralyzing you on stage. This mental and emotional work is exhausting and often invisible to the audience members, but this is exactly the balancing act you do when you are performing. You run back and forth in your head and your heart. In my own naivety, I thought I would be able to bury difficult stories once I told them or become less affected by their negative emotional impact. Yet what I have learned during these past few months performing my solo show, fringe or not, is that these stories have increasingly become triggering, even prior to what took place in Charlottesville. I’ve started to notice that tears swell up at moments I don’t anticipate, moments that I didn’t even know could still hurt or hurt at all. It is as if wounds I thought had healed had reopened in new ways, in ways I didn’t see or think were possible. These new wounds are cut gently, yet deep, like a thin knife slowly slicing through your skin. It took me a while to understand why it is sorrow that I am feeling these days. With each telling, I am not simply reliving my past experiences as they were. I am also re-experiencing them as they take on new meanings and new urgency under the current sociopolitical context within which I tell tales. And with each telling, these newly reconstituted experiences cut my soul in new ways. I feel sorrow about the history that continues to repeat itself and the lessons that humanity has yet to learn. At this particular historical juncture of political chaos, I know I need to tell these difficult stories. They need to be told and heard. Yet I have also become acutely aware of the emotional cost to my own psyche as I tell them each time. It is true that the act of storytelling heals you, but it can also cut you unexpectedly in the midst of healing. That’s the paradox I’ve begun to recognize. 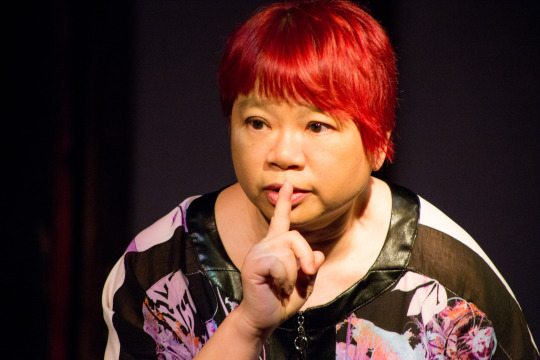 Not Quite is lived, written, and performed by Ada Cheng. She is performing this profound one-woman show during the Boulder International Fringe Festival August 18-25. Tickets are available here. Read Ada’s powerful piece on Not Quite from #BtFW’s Minnesota Fringe Symposium for more information.